The Sundarbans National Park (Bengali: সুন্দরবন জাতীয় উদ্দ্যান) refers to a National Park, Tiger Reserve, UNESCO World Heritage Site, and a Biosphere Reserve located in the Sundarbans delta in Indian state of West Bengal. Mangrove forests densely covered the region, serving as one of the largest reserves of the Bengal tiger. The park also serves as home to a variety of bird, reptile, and invertebrate species, including the salt-water crocodile. 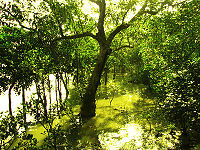 Sundarbans National Park received its name from the local mangrove sundari trees found in abundance throughout the park. The Sundarbans had been declared the core area of Sundarbans Tiger Reserve in 1973 and a wildlife sanctuary in the year 1977. 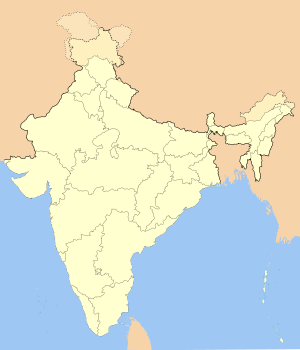 On 4 May 1984, the Indian government declared the area a National Park. UNESCO designated Sundarbans National Park a World Heritage Site in 1987. 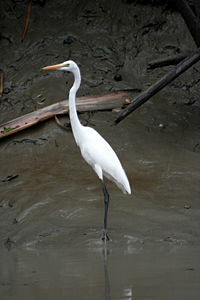 The whole Sundarbans area had been declared a Biosphere Reserve in 1989. Sundarbans National Park lay in between 30° 24' - 30° 28' N longitude and between 77° 40' - 77° 44' E latitude in the South 24 Parganas district in the Indian state of West Bengal. On average, the park stands 7.5 m above sea level; 54 small islands reside within the park and several tributaries of Ganga River and Brahmaputra River crisscross it. Sundarbans National Park hosts the largest estuarine mangrove forest in the world; 26 of the 50 broad mangrove types found in the world abound in the Sundarbans. The commonly identifiable vegetation that grow in the dense mangrove forests at the Sundarbans include salt water mixed forest, mangrove scrub, brackish water mixed forest, littoral forest, wet forest and wet alluvial grass forests. The average maximum and minimum temperature measure 34 °C and 20 °C respectively. Rain falls heavily with humidity reaching as high as 80 percent close to the Bay of Bengal. The monsoon lasts from mid-June to mid-September. Prevailing winds blow from the north and north-east October to mid-March and south-west westerlies prevail from mid-March to September. Storms, which sometimes develop into cyclones, occur commonly during the months of May and October. Sixty four plant species grow in Sundarbans; they have the ability to withstand estuarine conditions and saline inundation arising from tidal effects. In the month of April and May, the flaming red leaves of the Genwa, the crab-like red flowers of the Kankara, and the yellow flowers of Khalsi appear, adding to the beauty to the park. Some of the more commonly found plants and trees in the park include Genwa, Dhundal, Passur, Garjan, Kankra, Sundari, and Goran. The Sundarbans forest serves as home to more than 200 tigers. The Royal Bengal Tigers have developed a unique characteristic of swimming in the saline waters. They have become world famous as man-eaters. In addition to the Royal Bengal Tiger, Fishing Cats, Macaques, Wild Boar, Common Grey Mongoose, Fox, Jungle Cat, Flying Fox, Pangolin, Chital, live in abundance in the Sundarbans. Some of the more popular birds found in that region include: Open Billed Storks, White Ibis, Water Hens, Coots, Pheasant Tailed Jacanas, Pariah Kites, Brahminy Kites, Marsh Harriers, Swamp Partridges, Red Jungle Fowls, Spotted Doves, Common Mynahs, Jungle Crows, Jungle Babblers, Cotton Teals, Herring Gulls, Caspian Terns, Gray Herons, Brahminy Ducks, Spotted Billed Pelicans, Large Egrets, Night Herons, Common Snipes, Wood Sandpipers, Green Pigeons, Rose Ringed Parakeets, Paradise Flycatchers, Cormorants, Fishing Eagles, White Bellied Sea Eagles, Seagulls, Common Kingfishers, Peregrine falcons, Woodpeckers, Whimprels, Black-Tailed Godwits, Little Stints, Eastern Knots, Curlews, Golden Plovers, Pintails, White Eyed Pochards, and Whistling Teals. Some of the fish and amphibians found in the park's waters include Sawfish, Butter Fish, Electric Rays, Silver carp, Star Fish, Common Carp, King Crabs, Prawn, Shrimps, Gangetic Dolphins, Skipping Frogs, Common Toads, and Tree Frogs. 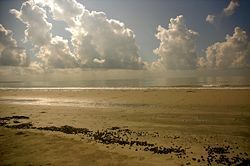 The Sundarbans National Park hosts an abundance reptiles as well, including Olive Ridley Turtles, Sea Snakes, Dog Faced Water Snakes, Green Turtles, Estuarine Crocodiles, Chameleons, King Cobras, Salvator Lizards, Hard Shelled Batgun Terrapins, Russels Vipers, Mouse Ghekos, Monitor Lizards, Curviers, Hawks Bill Turtles, Pythons, Common Kraits, Chequered Killbacks, and rat Snakes. Royal Bengal Tiger, Estuarian Crocodile, River Terrapin (Batagur baska), Olive Ridley Turtle, Gangetic Dolphin, Ground Turtle, Hawks Bill Turtle and King Crabs (Horse shoe) number among the endangered species living within the Sundarbans. The park has received government protection since its inception. The core area prohibits by strictly enforced laws all human activity including collection of wood, honey, fishing and other forest produces. In buffer area, the government permits fishing, honey collection and wood cutting within limits. Well-armed agents patrol the park in motorboats and launches, protecting the park from poaching and theft of forest products. The government maintains park offices and camps at several important points in the park. Two or three experienced deputies man anti-poaching camps under the supervision of Park Rangers. The government maintains the wildlife habitat through eco-conservation, eco-development, training, education and research. Ten Forest Protection Committees and fourteen Eco-development Committees have been formed in the fringe of Sundarbans Tiger Reserve to promote the protection of the environment. Park officials conduct seminars, workshops, awareness camps, frequently in and around the park to educate people on environmental issues such as eco-conservation, eco-development. The government plants and maintains mangrove forest and other trees in the fringe area to meet the need for fuel wood for about 1,000 villages local to the park, and to conserve the buffer area. Conservation of soil projects maintain the ecological balance of the park. Several sweet water ponds have been dug inside the park to provide drinking water to the wild animals. Controlling man-eating tigers constitutes another major activity for park officials. The number of deaths has been reduced from 40 to 10 per year, the result of strict control over the movement of the people inside the tiger reserve, alternative income generation and safety awareness training among people. The use of human masks and electric human dummies has aided in thwarting the tiger's tendancy to attack and kill people. Nylon net fencing and solar illumination of villages, along with other measures, has helped prevent the straying of tigers into nearby villages. The village youth have been receiving training on controlling the straying of tigers into the villages. The Mangrove Interpretation Centre has been established at Sajnekhali to foster awareness among the local people and tourists about importance of conservation of nature in general and specially the mangrove eco-systems. Though tough laws protect the park, a few loopholes exist. The geographical topography with jungle wilderness terrain criss-crossed by several rivers and their tributaries, a long international border with Bangladesh, fishing trawlers and launches makes complete control of poaching and cutting of the mangrove forests for fire wood, difficult. Lack of park staff, infrastructure and funds contribute to the gaps in protection of the park. Hiring a boat and floating down the various lanes formed by the many flowing rivers represents the only means of traveling the park. You can travel in any of the local boats or in luxury launches namely M.V. Chitrarekha and M.V. Madhukar, operated by the tourism department. In addition to viewing the wildlife from the boat safaris, you can also visit the following places in Sundarbans: Bhagatpur Crocodile Project (a crocodile breeding farm accessed from Namkhana), Sagar Island, Jambudweep, Sudhanyakali watchtower, Buriidabri Tiger Project, Netidhopani Watchtower, Haliday Island (famous for Barking Deer), Kanak (nesting place of Olive Ridley Turtle), and Sajankhali Bird Sanctuary (famous for avian fauna). Forest lodges and forest rest-houses accommodations may be rented at Sajnekhali, Bakkhali, and Piyali. The cruise launches MV Chitralekha and MV Sarbajaya also have lodging facilities. Visitors can find lodging facilities at Sundarbans Jungle Camp on Bali Island, run by Help Tourism Group with collaboration with local communities and members of Bali Nature and Wildlife Conservation Society. Nearest airport: Dum Dum airport at Kolkata, 112 km away. Nearest railhead: Canning, 48 km away from the Park. Nearest Road: Road transportation, available from Kolkata for Namkhana (105 km), Sonakhali (100 km), Raidighi (76 km), Canning (64 km), and Najat (92 km), all near the Sunderbans and with access to the riverine waterways. Nearest town: Gosaba, 50 km away. Nearest city: Kolkata, 112 km away. November to February, when the tigers can be seen on the river banks having sunbath, constitutes the ideal time to visit the park. Entry Permits: The foreign tourists wanting to visit the tiger projects and the Sajnekhali, have to obtain the special permits for entry into the Sundarbans National Park. They must contact the Secretary, West Bengal Forest Department, Writer's Building, Kolkata - 700001. To obtain the entry permit for other areas of the Sundarban, tourists must visit the Field Director, Sundarbans Tiger Reserve, PO Canning, District 24 Parganas, West Bengal. 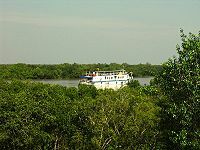 A boat cruise through Sunderbans outside the sanctuary requires no entry permit. People aboard a small boat in the Sunderbans in Bangladesh. Boats in a dim light in the Sundarbans. ↑ Sundarbans National Park, UNESCO, 2008. Retrieved February 5, 2008. All links retrieved October 27, 2015. Indian Wildlife Tours Sundarbans National Park. History of "Sundarbans National Park"
This page was last modified on 27 October 2015, at 16:32.